A new issue of the Interdiciplinary Tai Studies Series TAI CULTURE dedicated to the topic “Tai Ahom in Assam” is now available. The 210 p. volume was edited in collaboration between SEACOM southeast asia communication centre Berlin (Germany) and the Purna Kanta Buragohain Institute for Tai and Southeast Asian Studies, Guwahati, Assam (India). 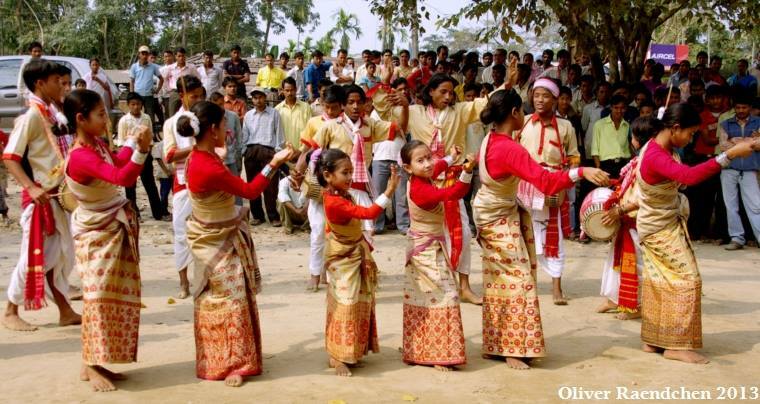 Although there exist a good number of studies and publications on Assam and the Tai Ahom altogether – mostly written by Tai Ahom or other scholars from India, and many of the works are in Assamese language – in general there has been limited awareness among other Tai peoples of Asia and among international scholars on the historical role, development, achievements, and specific characteristics of the Tai people who are called Ahom in Northeast India, and about their former Tai kingdom in Assam. This new volume aims to shed more light on the history and culture of the Tai Ahom, and to give indigenous Ahom researchers and scholars from Assam a voice in an international publication as they are able to research and interpret primary sources in Ahom and Assamese languages. The volume consists of 16 research articles, photo reports, bibliographies and glossaries, including articles on the Buddhist Tai ethnic groups in NE India, Impressions and thoughts on the Tai Ahom and other Tai in NE India, Tai Studies in Assam, the Historical background of Tai Ahom law, Ahom warfare, the Diplomatic relations of the Tai Ahom court, Tai Ahom-Assamese dictionary manuscripts, Inscriptions in Tai Ahom language, the Priestly classes of the Tai Ahom, Tai Ahom cosmology and traditions, Burial sites of Tai Ahom kings, and many more. The volume can be ordered via the SEACOM homepage http://www.seacom.de (click on “TAI CULTURE”). © Photo by Oliver Raendchen, 2013. From the 23rd through the 27th of September 2013, the German Oriental Studies Conference takes place in Münster. The conference is organised by the German Society for Oriental Studies, the oldest and most important association for scholars of Oriental Studies in Germany. The indologist Oskar von Hinüber/Freiburg will be the keynote speaker for the conference opening on Monday. Gudrun Krämer/Berlin, scholar of Islamic studies, will deliver a keynote address on the first evening of the conference. Oliver Raendchen, general editor of the SEACOM publication TAI CULTURE , will today launch the latest issue of the series with the title “Route of the Roots: Tai-Asiatic Cultural Interaction” in the Panel on Southeast Asian Studies. This issue of TAI CULTURE, which has just been published and can now be ordered via our homepage, had been edited in collaboration with Walailak University, Nakhorn Si Thammarat, with co-editor Prof. Cholthira Satyawadhna who will also be present at the book launch. Some exciting new titles are available from River Books, Bangkok, including ‘Thai magic tattoos’, ‘Backstage Mandalay’, ‘Lacquerware journeys’, ‘Siamese coins’, ‘Temples of Cambodia’, ‘Sacred sites of Burma’, and many more. To browse their catalogue, visit http://www.riverbooksbk.com/ . A selection of books is also available as e-books.